BioWare is releasing the Extended Cut downloadable content for sci-fi role-playing game Mass Effect 3 on June 26, it said today. You'll be able to download it for free on PC, Xbox 360, and PlayStation 3. It's a whopping 1.9 gigabytes. "The Extended Cut expands on the endings of Mass Effect 3 through additional scenes and epilogue sequences," BioWare said on its website. "It provides more of the answers and closure that players have been asking for. It gives a sense of what the future holds as a result of the decisions made throughout the series. And it shows greater detail in the successes or failures based on how players achieved their endings." "The Extended Cut is an expansion of the original endings to Mass Effect 3. It does not fundamentally change the endings, but rather it expands on the meaning of the original endings, and reveals greater detail on the impact of player decisions." You'll have to resume a saved game from the Cerberus Base attack section in order to see the new content, which BioWare says will change based on what you've done in the series so far. "The Extended Cut endings will differ depending on choices made throughout the Mass Effect series, so multiple playthroughs with a variety of different decisions will be required to experience the variety of possibilities offered by the new content," BioWare said. The ending of Mass Effect 3 has turned into one of this year's biggest controversies. Just days after the RPG was released this March, the Internet exploded with upset reactions from fans who felt the conclusion to Shepard's story had not lived up to their expectations. Many complained that their choices had no effect on the ultimate resolution of the popular sci-fi trilogy. Fans even started a petition to demand that BioWare change the game's conclusion. 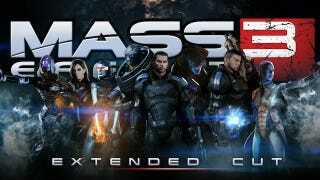 In late March, BioWare announced that it would release new downloadable content to add new scenes and provide "more clarity for those seeking further closure" to Mass Effect 3. Kotaku writers had a variety of differing opinions on the controversial ending. Some of us loved it. Others hated it. My Mass Effect 3 Ending Lasted 34 Hours. It Was Wonderful.